Water is so very good for you but it can get just a tad boring, if I am honest. I love to drink something with a little flavor. Apparently, I am not alone, as flavored waters have become extremely popular. Grape, orange, strawberry-kiwi are all options. But take a look at the nutrition label on that flavored water bottle. I happened to do that recently and found a long list of unrecognizable ingredients. I'll take just plain water, please. 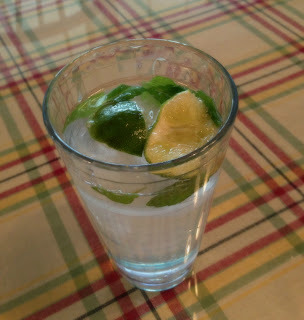 Another option that is very popular is to add a slice of lemon to water to give it a little flavor. This is simple and tasty and I still enjoy adding lemon to both water and tea. But a few months ago I decided to try adding lime instead, for something different. As I was preparing it, I noticed the mint plant on my windowsill. I started thinking...if lime and mint taste so good together in a mojito (not that I would know, as I don't really drink...but I DO know that a mojito is a popular cocktail!) wouldn't it be a good combination for water? So I added a few torn mint leaves, along with the lime, to my ice water. And, guess what? It was delicious! So refreshing and different. This is a great option for hot, humid days. Since then I have been serving this at my picnics as one of my beverage options and it is always a big hit. I encourage you to give this a try. And, by the way, mint is very easy to grow outside. Any type of mint can be used for this. In fact, this year I planted a "mint garden" and have had fun experimenting with all different types of mint leaves -- from pineapple mint to spearmint. If you give this a try, let me know how you like it!